Colette Braeckman reports that a French theater director is reprising an Athol Fugard play, originally written during the apartheid era, with Rwandan and Congolese comedians in the roles originally meant for a white and black South African. 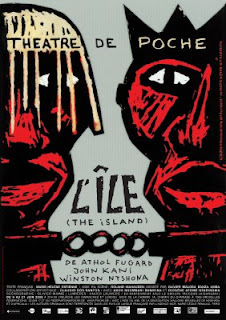 The play, which sounds like a blast if you find your Beckett just a wee uplifting, features the two men imprisoned together on an island off the coast of Africa, who support each other not out of any hope of ever being released than out a a shared sense of dignity they derive from their memory of reading Sophocles' Antigone. The play is in Brussels at the Theatre de Poche until June 27, and will tour in several cities in Congo and Rwanda afterwards. Director is Roland Mahauden, with Ados Ndombasi and Diogène Ntarindwa. I hope someone makes a documentary about the play's reception in Africa. It's always interesting to see how different cultures reflect on and draw meaning from each other.